Abiotic and Biotic factors are factors that influwence an animals life in any way at all. This includes food, habitat, shade and wind. Aboitic is a non living object while biotic is living. Abiotic might be a huge rock while Biotic might be the zeebra the lion eats. For the Ivory-Bill there is one major plant that has a major effect on it. 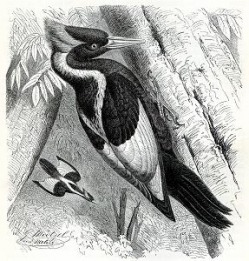 The Ivory-Bill needs a tree to make a nest and to live in. They also need trees because they attract bugs, which is what the Ivory-Bill eats. Reports say that Wood Peckers live better if they have a nest in it. This is because dead trees attrack more insects because its rotting, so woodpeckers get to have a field day with the amount of food pilling in. Abiotic effects the Ivory-Bill just as much as Biotic. One of the huge one for every organism in the world is tempicher. If the Ivory-Bill could never live in the desert because its way to hot. It can also not live in tundra or Frozen Deserts like the north pole. The pH of the water that it drinks has an effect because if its too low or too high then the animal would die. Biotic factors that effect the Ivory-Bills life are a lot of things. They can be the food it eats or the plants it interacts with. The two big ones are the trees that they live in. 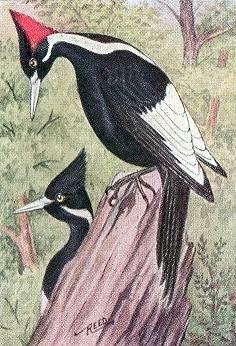 The main kind of trees that the Ivory-Bill likes is the cypress tree because its much taller then the other trees. Since the bird is rather large it needs to be able to fly above the trees to get around fast. A biome is a habitat that a animal lives in. This includes rain forest, deserts and tundras. all animals that live in a bionome is there because of a plant. The more plants that are in a Biome, the more animals that can live there. The Ivory billes Biome is a bad one because it has a really bad reputation. People see swampy forests as horrable, bug filled places that are way to hot and have lots of snakes. So when people destroyed swamps and cut down the expensive trees no one payed any mind. Although the Ivory Bill spent time in swamps and forests, it spent most of its time in the very tall tree, very close to the sun light. There are ideas that the Ivory-Bill usuesd to live in Cuba, but has long since disappeared there after Cuba cut down the trees in the swamps that the Ivory-Bill lived.